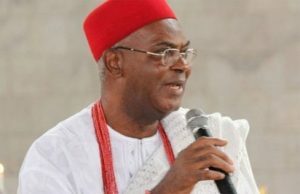 ONITSHA—The Obi of Onitsha, Igwe Alfred Achebe has attributed the present unemployment crisis bedeviling the youth population to the security challenges facing the country and warned that if drastic measures were not taken, the situation might deteriorate to an alarming stage. Achebe who made the observation in Onitsha yesterday at the graduation ceremony of 69 youths of Onitsha origin, who were trained in various vocations facilitated by the monarch, under his Ime-Obi Entrepreneurship Development programme for Onitsha youths and sponsored by Ford Foundation, described unemployment as fundamental to many of the social ills in the country which made youths to join cultism, kidnapping and robbery. Achebe explained that the programme was therefore aimed at making youths acquire skills and become useful to themselves and the society by becoming employers of labour, rather than waiting to become employees. According to the monarch, “one of those graduating today is already employing seven graduates in his outfit. It is one way to build the economy and the country and to discourage youths from committing crime”. The monarch disclosed that the first set of 70 youths, who were trained and assisted with loans worth N500,000 each, totaling N35 million have repaid over N33 million, even as he commended Ford Foundation for supporting the community outreach and entrepreneurship in Onitsha. He said: “the financial support was also used to organise long vacation programmes for secondary school students as well as special remedial programme for Onitsha indigenes seeking admission into universities. “We equally have drug addiction programme to prevent and rehabilitate our youths who are into drugs”. He therefore urged youths of Onitsha origin who were yet to register with the Onitsha Youth Council to do so in their interest and for their development.